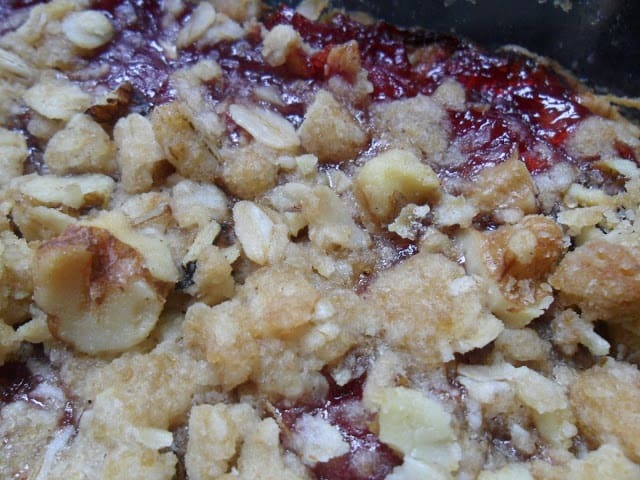 Oatmeal Jumble Bars are made with Rhubarb Cranberry Apricot Fruit Pie Filling A delicious mixture of rhubarb, cranberries and apricots. If you would rather not make this yummy filling, even though you really should, you can easily substitute any fruit filling of your choice. You can certainly use just a plain rhubarb filling also. Solo has many wonderful pie fillings to choose from; date, poppy seed or prune to name a few. Oatmeal Jumble Bars is a basic oatmeal bar recipe that is made with oatmeal, flour, brown sugar, shortening, spices and chopped walnuts. Half of this mixture is pressed into a prepared baking dish. 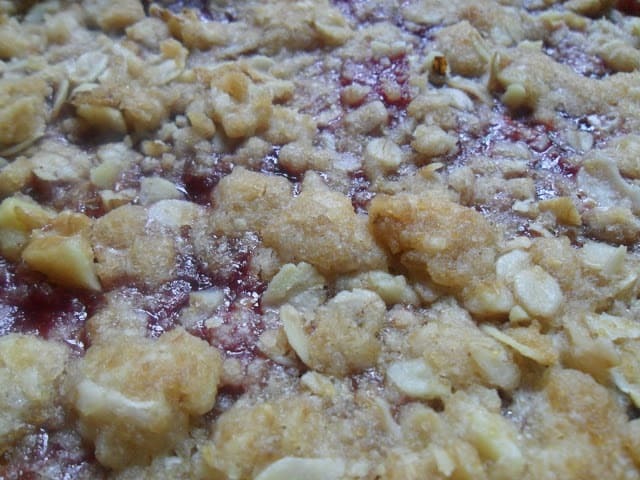 Then topped with your favorite fruit filling or topped with rhubarb cranberry apricot filling. The remaining crust mixture is then sprinkled over the fruit filling and baked in the oven for 30 minutes or so. Easy and Delicious. *Make up a batch or two of these delicious oatmeal jumble bars and watch how fast they disappear! 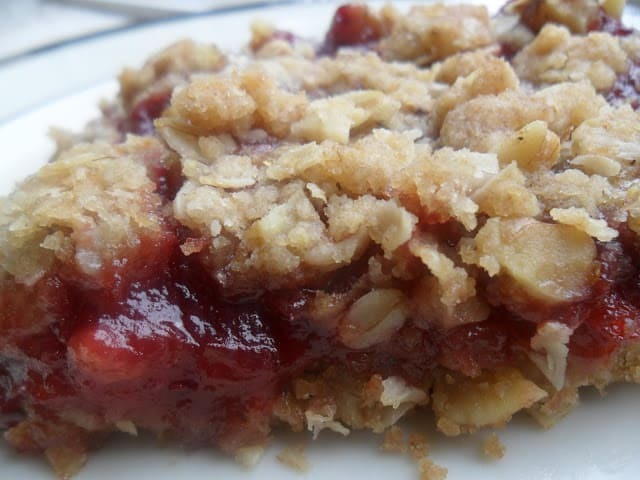 Oatmeal Jumble Bars are made with a homemade rhubarb, cranberry and apricot pie filling or you can use your favorite pie filling. In a medium bowl, combine the flour, rolled oats, packed brown sugar, baking soda, salt and cinnamon. 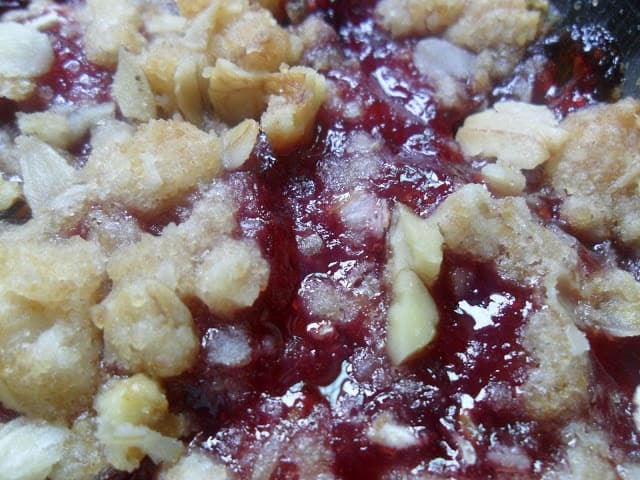 Using a pastry blender, cut in shortening until mixture resembles coarse crumbs. Stir in lemon zest and chopped nuts. Reserve 1 cup of crumb mixture for topping. Press remaining mixture into the bottom of prepared baking pan. Evenly spread fruit pie filling over top. Sprinkle with reserved crumb mixture. Bake at 375º for 30 to 35 minutes or until top is golden brown and fruit pie filling is bubbly. Do you like rhubarb as much as we do? 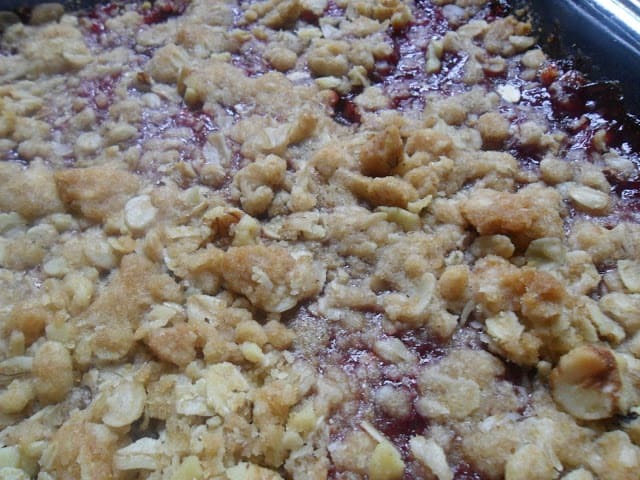 Check out our Recipe Box for more recipes using rhubarb.